The Scarlet Letter by Nathaniel Hawthorne (1804-1864) is one of those short classics that a reader knows by instinct that it must be a set text somewhere: it has all those themes of sin, guilt, punishment, shame and redemption that not only make the work a timeless classic, but also a wonderful text for literature students to explore. My old paperback edition, (one of the Wordsworth Classics series, still in print but now with slightly different covers), begins by calling it a classic enquiry into the nature of American Puritanism and the New England conscience during the seventeenth century. That doesn’t make it sound very enticing, especially if you’re not American, but if you ignore that and begin reading, it’s a fascinating tale, still relevant today. We might sometimes think that we live in a shameless society, but public condemnation is still feared by many people, and memories are long. The plot, should you wish to know it, is outlined in considerable detail at Wikipedia. 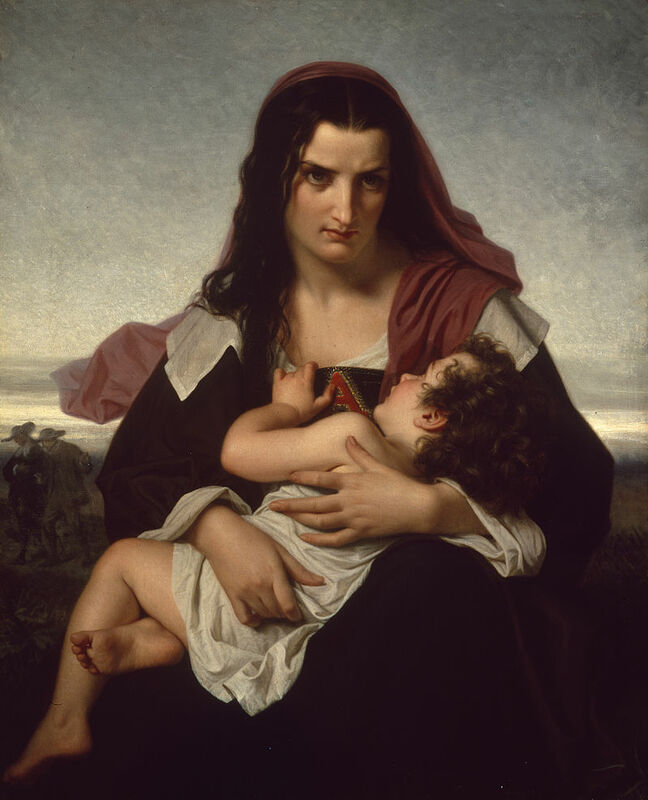 Hester Prynne is the central character who by order of the Puritan community in which she lives is required to wear a scarlet letter A on her bosom so that all the world may shun her as an adulteress. She has had a child by a man she will not name while her husband, following her from England to the fledgling town of Boston, has been delayed. He turns up in time to witness her shaming, and he sets out to have his revenge on the child’s father. The author, writing about a period long before his own, takes the opportunity to point out the irony of Puritans who’ve escaped tyranny inflicting tyranny of their own. The women of the town are the particular objects of his scorn, but he makes the hypocrisy of the town’s Elders a theme as well. But the main object of his contempt is Hester’s husband, Roger Chillingworth, whose long quest for revenge is the greatest evil in the book, greater even than little Pearl’s father whose fear of shame and punishment lets him abandon Hester in her hour of need. As a psychological study, it’s on a par with Stendhal’s The Red and the Black (see my review) but (once you get used to the 19th century writing style) it’s much easier to read and enjoy. I was interested to see at Wikipedia that this painting above was Hawthorne’s favourite. I don’t like it – I think the cover art on the book cover is a better depiction of Hester’s fate. The Scarlet Letter is included in 1001 Books You Must Read Before You Die. If all goes according to plan, this post will be published when I am in transit between London and Amsterdam. Depending on what happens with internet access, it may take a while before I can respond to comments, but I’d love to know if others have read this book and what you thought of it. It’s certainly a favourite of mine. Moral issues seem to have been discussed much more clearly in olden days. And happy travelling, I struggle to post when I’m away from home. Loved it. Timeless, in a way. I agree with you on the book cover. It has been a little too long since I read this. Your post is reminding me that it is time for another go around. Good point about this being a psychological study, that aspect os the novel has stayed with me over the years. You are right that this is a set text in many schools. I was forced to read it that way at an age when it had very little meaning for me. I should try again. Better yet for me was The House of Seven Gables which I read later and voluntarily. It has some of the same themes with even a bit of humor. Hello everyone, from Amsterdam:) I can’t tell you how nice it is to open up my blog and find friendly chat here, it’s just lovely! I’ve been reading The Buddha of Suburbia while travelling, and I have to say, I wish I’d brought The Scarlet Letter with me, I think it was a much better book….more to think about, and better written in every way. Amsterdam? I hope you have a few days to look around there. Take the canal tour – it’s interesting and also orients you to the layout. The big State museum was closed for renovations when I was there, but there are many other good places to visit. Arrive at the Van Gogh Museum *before* it opens to get an early place in line. I read ‘The Buddha of Suburbia’ years ago and liked it; I wonder if it’s a bit dated now? Yes, it feels dated. But more than that, it’s really adolescent in attitude. I’m not enjoying it much but I’ve nearly finished it, so I’ll press on. If you want to read my billet, it’s here. Style apart, it’s an interesting story and I’m always disappointed in human nature when I see people who suffer(ed) from injustice or great tragedy inflict it on others. And that’s exactly what these puritans do, as you rightly mention it in your review. Oh, I agree with what you say in your billet about the prologue, I can only say that I think it was common to write those sort of prologues in that era, I’ve read similar ones in other C18th books and I find them a bore. I think they may have had a religious purpose in an era when novels were thought to be frivolous, a pompous prologue made the book seem respectable perhaps. But I did like the story very much. 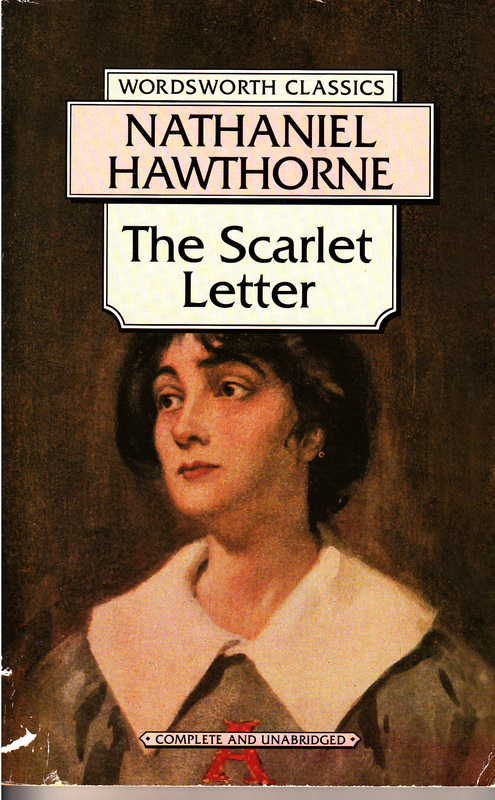 As you say, here we see human nature being judgemental and cruel, and Hawthorne is very clear about the way some of the women enjoyed being so cruel – they weren’t trying to save her soul, they were just being vindictive. BTW you would have been proud of me today. I was on a tram here in Amsterdam and there was a dear old man tottering along and he hadn’t noticed that there was a seat behind him. So I got my husband to show him and he sat down next to me and said ‘merci’. So he wasn’t Dutch, and we got chatting, me with my very bad French and him with not a word of English, I think. I was so glad I could talk to him:) He didn’t have a clue where he was so we located it on his map so that he could follow the tram route and get off in the right place. I often think of my old dad (who lives interstate) out and about in an world that’s mostly indifferent to old people so I like to help when I can, what goes around comes around. I don’t think my French will be any use in Belgium, though, apparently they have a very different accent and it’s quite hard to understand even for French people. PS That’s a great discussion about this book on your blog, Emma! Ok, well, I’ll certainly give it a try! This is one of those books I’ve long meant to read, so thanks to your insightful post I will have to bump it higher up my reading queue. Hope you’re enjoying Amsterdam. I have a friend who lives there and keep meaning to go visit seeing as he always camps on our sofa whenever he’s in London. LOL Kim I think you’d be horrified by some of the Brits who are here. They are not very good ambassadors! ‘The Scarlet Letter’ is one of my all-time favorites as is ‘The House of the Seven Gables’. I actually read this at work (naughty me) when I was in a call centre, probably on the night shift when I had about two calls an hour. It was through wiki and I remember enjoying it and finding it much more accessible than I expected. Funny thing, I thought about this book just today. There’s a video going viral of a (self-proclaimed) Christian having a rant about the US gay marriage decision, and I thought, gosh, there’s still people out there who think that they have a right to sit in judgement about the way other people choose to love each other, and have no qualms about expressing their beliefs in offensive judgemental ways. It didn’t look very Christian to me in the same way that the women in The Scarlett Letter didn’t seem very Christian to me…. And social media to broadcast our opinions!